We’re here to help people like you navigate health issues. HealthACR LLC will never give or sell any contact information to any third parties. An independent consultant who helps patients, their families & caregivers resolve crises and issues. We can help you navigate a confusing health care/insurance system with comprehensive services. As a Health Advocate, my objective is to work with patients, their families and/or caretakers who are facing health crises. This allows me to meld my counseling skills with over 35 years of extensive knowledge and experience with the healthcare field. I have a strong interest in helping those who face healthcare crises to identify & address the plethora of psycho-social issues that bombard them from multiple directions. I am intuitive and have a “helper” personality, which is useful in guiding clients and their families to positive resolution. 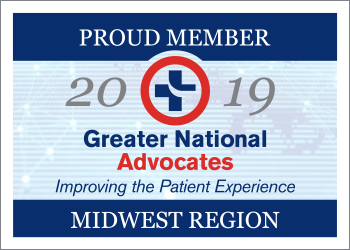 Lee Mulert is currently the Vice President of the Patient Advocate Certification Board (PACB) and recently completed three years of service as the Treasurer of the National Association of Healthcare Advocacy Consultants (NAHAC) of which she is also a member. She is a Certified Senior Advisor (CSA) and a member of the Alliance of Professional Health Advocates (APHA). She is committed to the Code of Ethics of each of these organizations. Lee is not only an incredible resource in identifying solutions to challenging health problems, she is an immense comfort during difficult times. Whenever I reach out to her, Lee responds quickly and addresses my concerns with a mixture of compassion and level-headed advice. She has proven helpful to me in both dealing with my daughter’s addiction issues and with navigating insurance and the healthcare system. When my daughter needed rushed lab results and a complete physical in order to be considered for an immediate treatment program, Lee called a doctor she trusted and we were in the next day. Having Lee on our side made a very trying time more bearable and I’m happy to say my daughter is doing much better now. However, I continue to consult with Lee for guidance. Her kind consideration and keen understanding of this complex landscape makes me feel I’m not alone in this struggle. I think some of the most important decisions in our lives are made with our hearts and not always our heads. When a decision has to be made that deals with the health of a loved one, our hearts dominate. What Lee did for me was balance the facts and sift through the details that needed to be addressed with empathy yet a clear head using facts not sentiment. She helped me to understand it would be ok to seek a second opinion and then helped to identify a different doctor who better fit our needs. Then she went with us to the first meeting to help capture critical information, make sure we asked key questions and to help me process everything during this emotional time. Lee Mulert has provided her professional services as a Health Advocate supporting the needs of myself and my family for several years, beginning with a crisis and continuing with a prolonged tough situation that has presented many challenges. It was hard during the initial crisis to find appropriate care for our family member and to navigate our own emotional difficulties as we worked through the situation. Lee is a committed professional, specifically focused on helping the patient and family navigate the healthcare system. She works hard, advocating on behalf of her clients in her efforts to find the optimal solution for everyone. She offers solutions but doesn’t press them on you. Lee balances being compassionate while maintaining her professional role. During bad times, she digs deep to help you through and remains a great support through better times. Lee can personalize what she offers to meet the needs of her clients, providing a range of service options. She is a kind, compassionate, intelligent and strong person. I am confident that she will bring the same warmth, support, insight and hard work to any of her clients. Lee was instrumental in helping us while our son was battling leukemia which began when he was 9 and unfortunately continued over multiple years and courses of treatment. Several times she was able to help us to identify alternative options in terms of physicians or sources of treatment. She also helped us to think through which treatment options made the most sense for us, for example whether our son should participate in a clinical trial. Her ability to be calm, to think through issues and identify possible solutions was especially helpful at times of stress. Without Lee, our journey would have been much more difficult and potentially not quite as successful. “My wife & I have been very pleased with the professional & trustworthy services that Lee Mulert has provided for my 88 year-old mother for over 2 years. We live almost 1800 miles away from my mother and have the utmost confidence in Lee’s abilities to make sure that her health care needs are met. These include routine doctor visits, procedures and following physician direction re other follow up as needed. This has also included being responsive to emergency situations and present with my mother at the ER and hospital to make sure her needs were met. Lee’s education, training and knowledge, along with her ability to communicate with the clinicians, creates great peace of mind for both of us. She interacts with my mother in a firm yet kind, pleasant and gentle manner. My mom is comfortable with and trusts Lee. Following any provider visit, Lee immediately provides us with an update. This is especially important during emergencies. With Lee’s assistance, my mother is able to remain independent in her home as she wishes. Lee has also assisted, at our request, by identifying 2 other resources to help with groceries/food preparation and with bill management/payment. We highly recommend Lee and the services she offers through Heath ACR LLC. Can we help you navigate a health dilemma? Or fill out the form below and we will reply as soon as possible. HealthACR LLC will never give or sell any contact in formation to any third parties.